After the success of his 2017 album Steel Town, particularly the single Suitcase, Steve Moakler hasn’t taken his foot off the gas. After a hectic few months touring, including some shows on Tim McGraw and Faith Hill’s Soul2Soul Tour, he headed out on the road with his wife for the Hometowns and Campgrounds Tour, a unique chance to meet his fans and play some intimate shows. Following that he worked on a ‘road song’ for Mack Trucks which led to his next LP, Born Ready, which is to be released in June. After such a busy 12 months, we were lucky enough to interview Steve recently and catch up on it all! I’m pretty good. I’m having a pretty restful day at home, we’re heading out on the road again tomorrow so today is kind of my day to gather things back up and try to have some fun and see some friends. It’s been a year since we last spoke, that was around the release of Steel Town. What have you been up to in the last 12 months? Well since the release of Steel Town, a large portion of that time has been on the road. That record, particularly the song Suitcase, took me on a ride. It wasn’t a huge, huge hit or anything but, relative to my career, it was definitely a big wave that we got to ride. You’re back pretty quickly with a new record, Born Ready, which is out in June. How have you managed to get that recorded between touring and promoting Steel Town? Well, we did slow down. About six to eight months after the record came out we were touring and then my wife and I went on this little journey that we called the ‘Hometowns and Campgrounds Tour’ this past fall, where we played private concerts in a lot of back yards and farms. It’s always a really inspiring thing to do. Then I was able to take the winter to just write. That was huge, there was definitely some pressure there to turn it around. My publisher wasn’t sure, he was like “I don’t know if you’ve got enough time mathematically!”. There was some real inspiration there. Also, we did have a couple of songs that we loved that didn’t make it onto to the Steel Town record just because they felt a little redundant on that record. So we had a couple of songs that I thought were really important in the back pocket. I was asked to write a road song for Mack Trucks which sort of ended up leading me to a well of inspiration. I realised, when I was singing about the road and the highway, that there was kind of a whole well of inspiration there that I may have missed because nobody told me to go over and look at it, so that kind of led to more songs. The label sent me over the new record to listen to today for the first time. Steel Town was obviously quite an introspective and autobiographical record with songs about your upbringing and hometown. This record feels slightly different in its approach, with a lot of love songs, songs about living in the now and growth, is that some of the inspiration? That does feel right. I like that description! I think that Steel Town was about my roots and looking back, ironically that record about my home town led me to a new season in my life that was on the road. I feel like the road requires a lot of you, you are where you are and you might be missing somewhere or rather be somewhere. I think it is very much and ‘in-the-moment’ record. Also, part of that too is that having played so many more concerts in the last couple of years and playing for bigger crowds than I ever had has influenced my instincts when I’m going to write. In the past it might have been more of a smaller venue, let me tell you my story, a little more of that singer-songwriter coffee house kind of feel. I think getting out in front of bigger audiences, feeling that energy and wanting songs that kind of hold that relationship to that moment. A lot of those tend to be in-the-moment kind of songs. It’s interesting that you say that, one of my early favourites on the record is Devices and the song has a really soulful sound to it. I was going to ask if the album is a slight gear shift for you musically? You know, I don’t know if I’d say its a departure but there were so many of the same people involved in this record, same producer, a lot of the same band and, I think, a lot of the same songwriters. I think what we kind of did was push some boundaries, so almost imagine it’s the same garden sonically but there are some songs that are a little more traditional country, we kind of boldly approached that direction a little bit. There’s moments from Steel Town that we kind of elaborate on and take a little further on this record but not in one direction! Another favourite that I’ve got to mention, having just turned 30 myself, is 30. That speaks to me! Wow, man that’s cool. That’s one of my favourites so thank you! Yeah, I think so. I’m just kind of made that way. I suppose that’s been challenged over the years, as much as so many dreams have come true and it’s been amazing, there’s also been a lot of adversity. I think that perspective of mine is definitely still present but is maybe a little more weathered and tried. It comes out a little less glossy! I know I mentioned this last year but the lyrics to Riser still hang up in my house and certainly gave me a lot of strength when I was suffering from depression. I guess that’s how songwriting can help people? Wow, man, that means a lot. Travis and I both hear a lot of stories like that and it’s honestly one of the most fulfilling parts of being a songwriter is to know that you can help people through those really dark times. It’s a huge blessing, thank you for sharing that. Moving on to the tour, you’re out all over the States at the moment. How’s it going? How are you finding the reaction to the new songs? This is my favourite show that we’ve ever put together! We’ve got a great band and I feel like, it can be a little daunting when you throw a load of new songs into a set because you know that people didn’t buy a ticket to hear your new songs. I have to say that I feel really confident with these songs based on how people have reacted having never heard them before. It’s some of the strongest reaction that I’ve ever had to new material which helps a lot! That was going to be my next question, does that help with any nerves you might have before releasing a new record? Yeah, I’ve released a lot of records just cold out of the gate. You go “ok, I don’t know!” and that’s always a bit of a scary feeling and I’ve had enough records that seem to create crickets! This has been really cool and I think it’s the first time that I’ve ever done a tour on the front end of an album like this. In some ways it’s challenging, maybe people are less excited to come out but I think we’re kind of hopefully building momentum into the record release which is exciting! Finally, I’ve got to move on to a little bit about us over here in the UK. How aware are you of the fans that you have over here and the people listening to your music in Europe and the UK? I’ll tell you what, I don’t feel aware. It’s funny that you called because my wife and I were sitting down and actually literally looking at a map saying that we really wanna get over there. I’ve been to London very briefly but I’ve never played there and it’s a dream of mine to perform there! I know there’s some people because we’ve talked on the phone but I don’t really have a grasp of who is listening. I’d love to come out and meet some friends, it’d be really cool. Well, I’ll tell you now that I know some people who love your music. Especially Steel Town, I think that grabbed a lot of people’s attention, we gave it one of our top five albums last year. There’s such a big love for songwriters over here and I know that a lot of people are listening to you through Dierks Bentley, there’s definitely an appetite. I think you’d get a big old crowd over here! Wow! I really wanna take that forward. That’d be such a thrill for me! If we make our way over, either on a tour or a personal vacation, I’d love to get in touch with you and meet up! 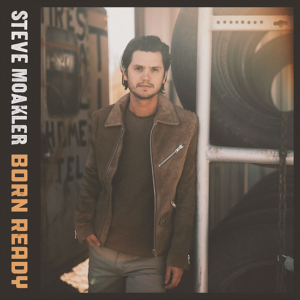 Steve Moakler’s new album Born Ready is released 15th June. You can pre-order it here.